Stepping into the cathedral-ceilinged lobby of Tugu Bali Hotel is akin to walking into an Indonesian den of antiquity. The place oozes history from every one of its ancient pores. The main Bale Agung building features distinctive architecture inspired by a secluded village in Central Bali. 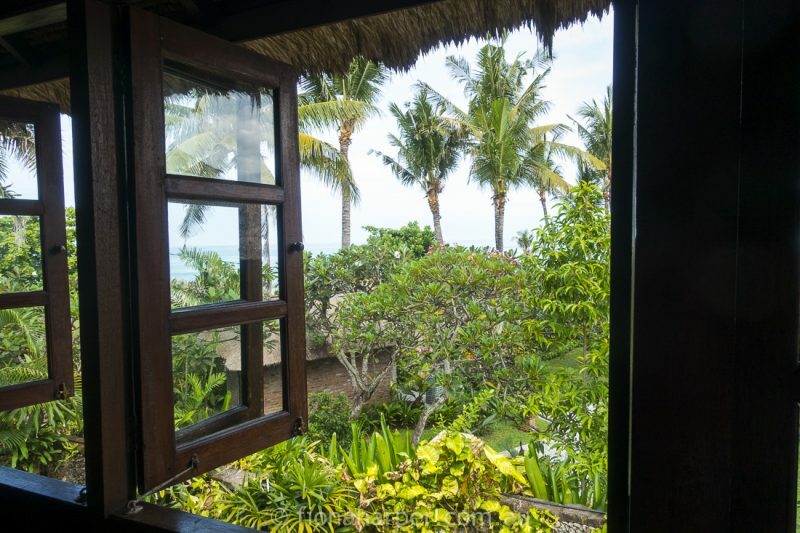 Other buildings are hundreds of years old, relocated to reside within resort grounds beside Bali’s Canggu Beach. It’s hard to know where to look with so much to catch the eye. 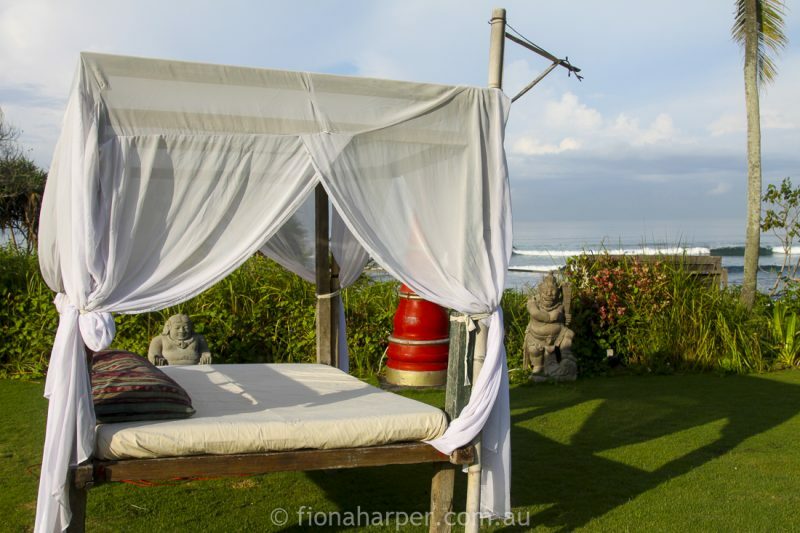 Tugu Bali Hotel is located beachside at Canggu Beach, a quiet surf beach in the quaint fishing village of Canggu approx 45 mins from Ngurah Rai International Airport. The hustle and bustle of Seminyak is around 15 minutes walk south along the beach (much longer by road). It feels a million miles away and a lot like how Bali used to feel like when I first came here in the late 1970’s. Tanned and taut surfers arrive at the beach on motorbikes with much-used boards strapped to their bikes. Gorgeous young surfer chicks emerge from the waves unable to wipe the grins from their faces. I envy their carefree youthfulness. A member of Secret Retreats, Tugu Bali Hotel is designed to bring back to life the romantic, forgotten tales of Java and Bali. 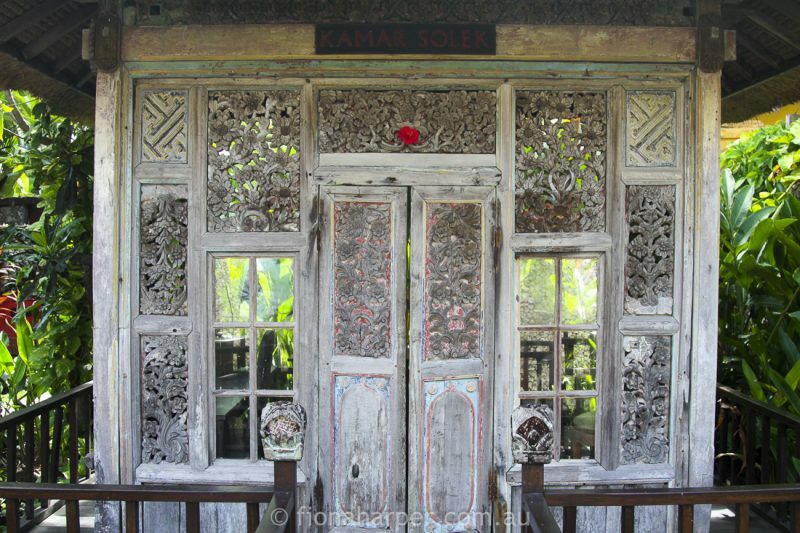 The hotel is owned by an Indonesian who has been collecting antiques since the 1960’s. It’s a living breathing treasure trove filled with surprises at every turn. 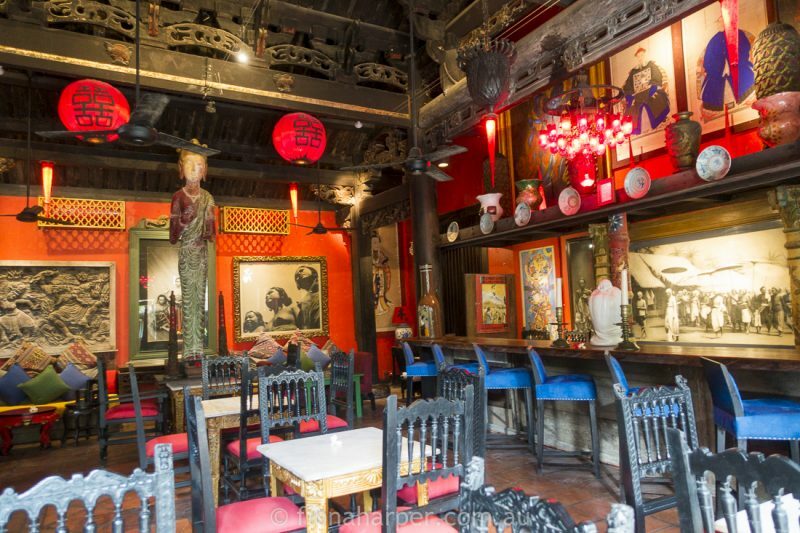 Tugu houses the largest collection of original artworks in Southeast Asia. My room: Dedari Ground Floor Suite with plunge pool. Hidden behind a high brick wall, the room is accessed via a carved antique teak doorway. 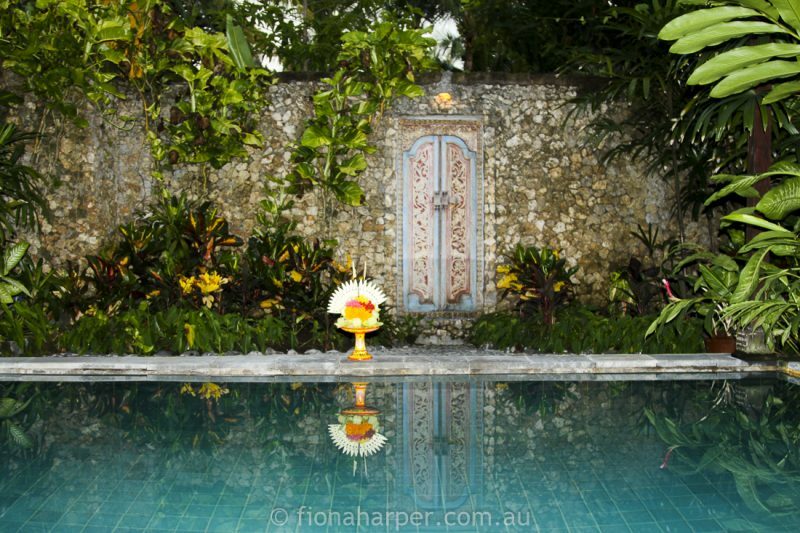 It has a private plunge pool in a walled garden with day bed, an indoor/outdoor bathroom with oversized bathtub and a lotus pond teeming with fish. The room is furnished with a muslin draped king bed, sitting area, work desk and minibar. Furnishings are traditional Indonesian antiques and antiquities. It’s all dark teak adorned with intricate carvings. Splendid: King bed, super comfy with crisp sheets & cotton throw, draped with curtains hanging from a carved teak canopy. Incense and candles create atmosphere. Good ventilation with sliding door to walled courtyard garden and plunge pool. Air conditioning worked superbly. Overall it’s a spacious room with two very comfortable lounge chairs beside floor to ceiling glass overlooking the garden and pool. Adequate: Light switches are obviously positioned / flat screen tv & dvd player / minibar pricing & choice. Could do Better: No fresh milk (only creamer sachets). 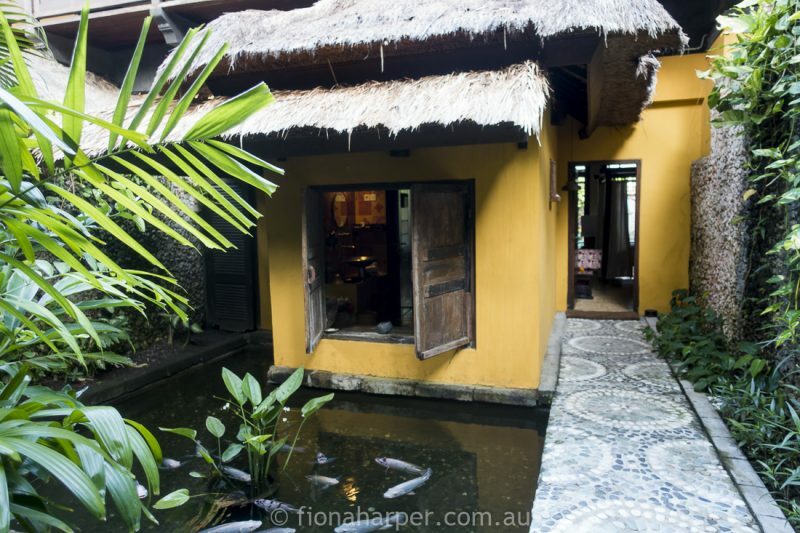 Splendid: Takes full advantage of the tropical climate with timber shutters opening out to a view of a fish-filled lotus pond – watch the fish as you bathe! Shower is combined with large sized mosaic-lined bathtub with oversized showerhead. Separate toilet. Amenities are generous. A single daybed could be used for in-room massages. Adequate: Hairdryer, fluffy towels, a bathrobe & slippers. Could do Better: Lighting in bathroom is poor and inadequate for applying makeup. Dining is an occasion at Tugu Bali where guests can choose to dine at any one of a number of locations. Choose a romantic spot in the garden, at the beach, or in a private dining pavilion for two above the lotus pond surrounded by nature subtley lit by candle light. The main dining area is within Bale Agung which serves as the central hub for the resort. It’s a gigantic space with cathedral ceilings supported by vast wooden columns. It’s dotted with antiques and ancient cultural relics. The space is dominated by a 4.5m high imposing Garuda statue carved from a single 120 year old tree trunk. Bale Sutra (The Palace of Harmony) – a 306 year old Kang Zi period temple that stands as a symbol of harmony between ancient Peranakan (Indonesian Chinese) and ancient Balinese culture. 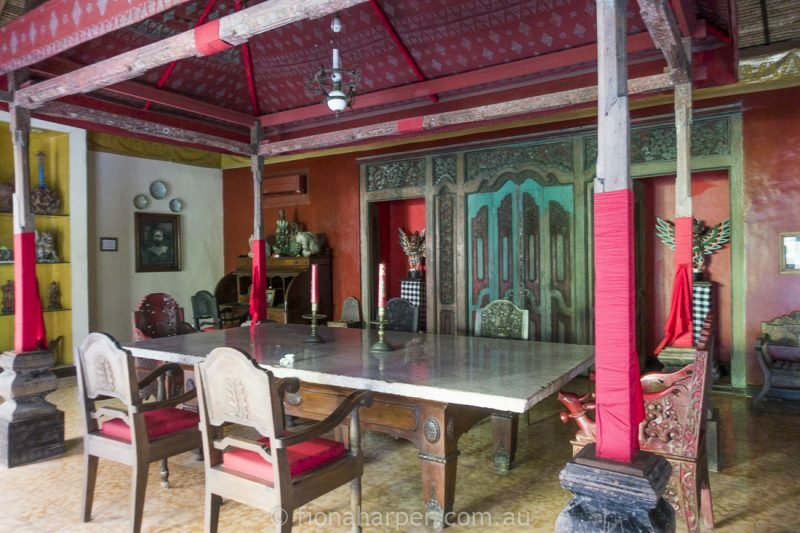 Bale Puputan – an elegant late19th century atmospheric room commemorating Balinese Heroes who opted to take their own lives rather than admit defeat during the Battle to the Last Man of 1906 – 08. 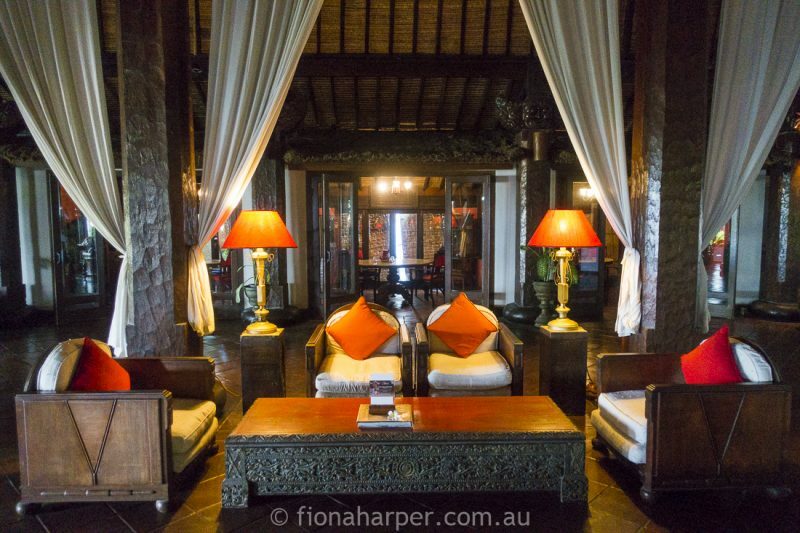 The room is filled with 19th century antiques from Balinese royal families. The Colony Room – a private room for up to six with ocean, pool and garden views. Lotus Pond – an intimate al-fresco tropical hut above the wild lotus pond surrounded by candles and torches, perfect for leisurely breakfasts or romantic dinners. Tropical garden or poolside – an intimate dinner or lavish dinner party can be set up anywhere amongst the gardens or poolside. Menus are influenced by traditional Balinese, Javanese, Chinese and Peranakan cuisine styles. 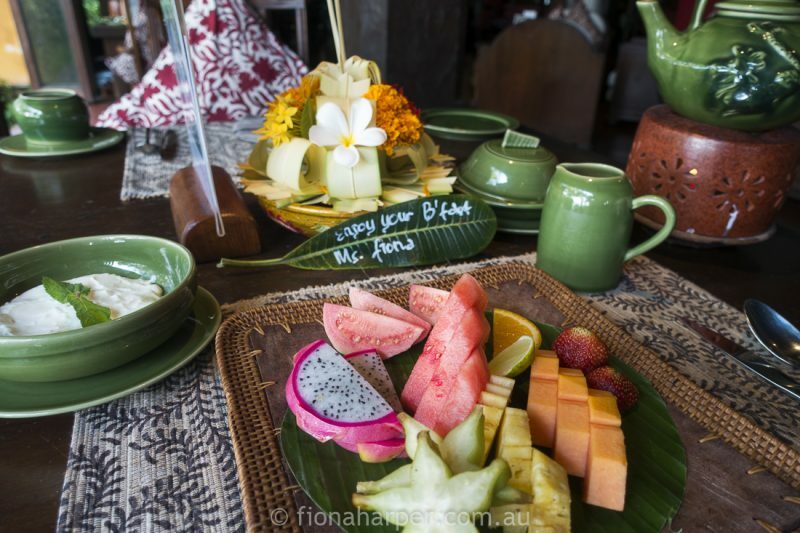 Tugu Bali hosts its own cooking school, and as you’d expect, the food at all venues is superb. 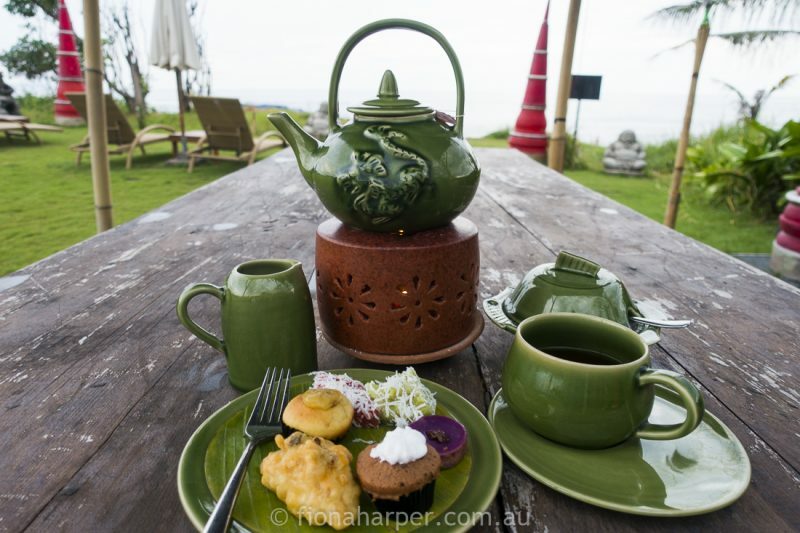 Afternoon High Teas are served daily at a venue chosen by guests – I took mine in the beachfront garden overlooking the surf beach. 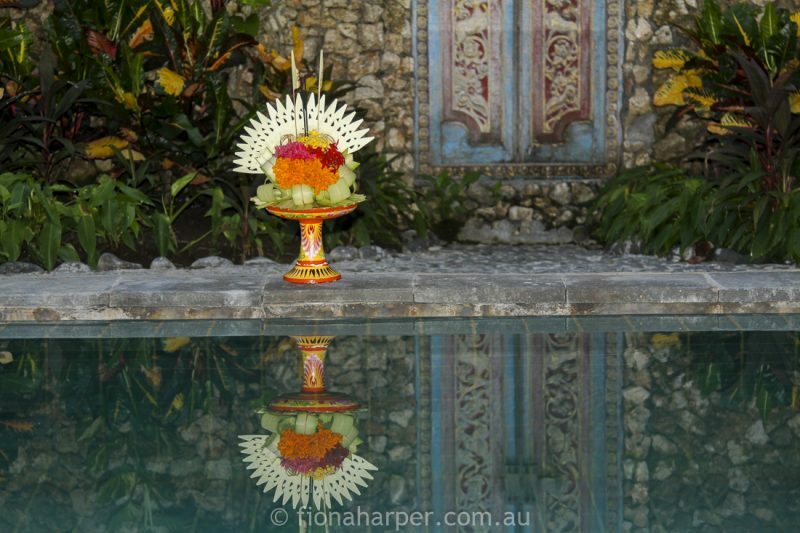 Dining is a special experience at Tugu Bali with a Cultural Dining Series influenced by ancient royal traditions. Take a traditional Balinese dance class accompanied by gamelon music, some of the most beautiful in Indonesia. Cooking classes begin with a market visit to pick up ingredients for a traditional Balinese meal cooked on wood-fired terracotta stoves, eaten with bare hands surrounded by stone grinders and steamers. 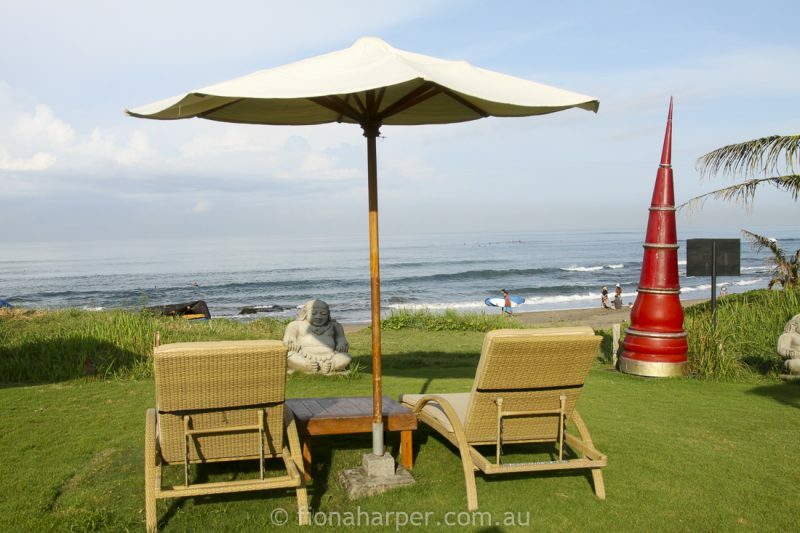 Take a bike tour, go horseback riding or a sunset horse-drawn Bendi ride on Canggu Beach. Fish market tours, tennis, yoga, art tours and trekking are all available nearby. Swimming Pool: There’s one swimming pool available for all guests, equipped with tables and chairs and sun lounges. Many suites have private plunge pools so the pool area is rarely busy. 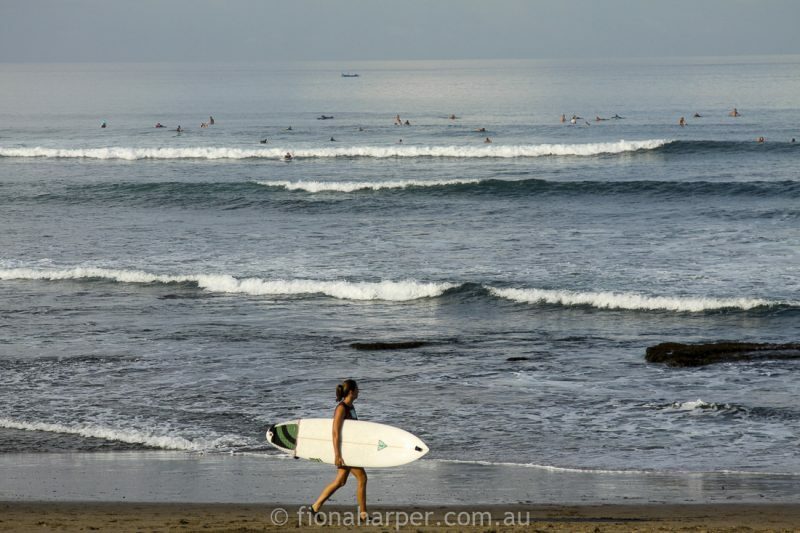 Nearby: Canggu Beach is one of Bali’s best surf beaches. Beachside are a couple of warangs (restaurants), surfboard hire and retail shops. Seminyak is approx 15 mins walk along the beach. Getting there: Complimentary return airport transfers are included. 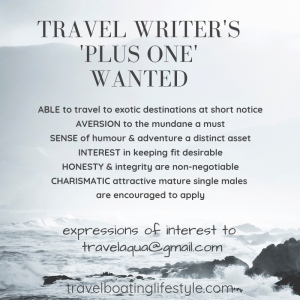 We love: Tugu Bali oozes character and charm, the staff are super attentive and the beachside private garden is perfect for being at the beach without the inconvenience of pesky sand and even peskier hawker intrusions. We’re completely in love with the little touches like personal welcome messages and turndown inspirational notes printed on handmade paper in antique style. We loathe: Bathroom mirror has poor lighting. 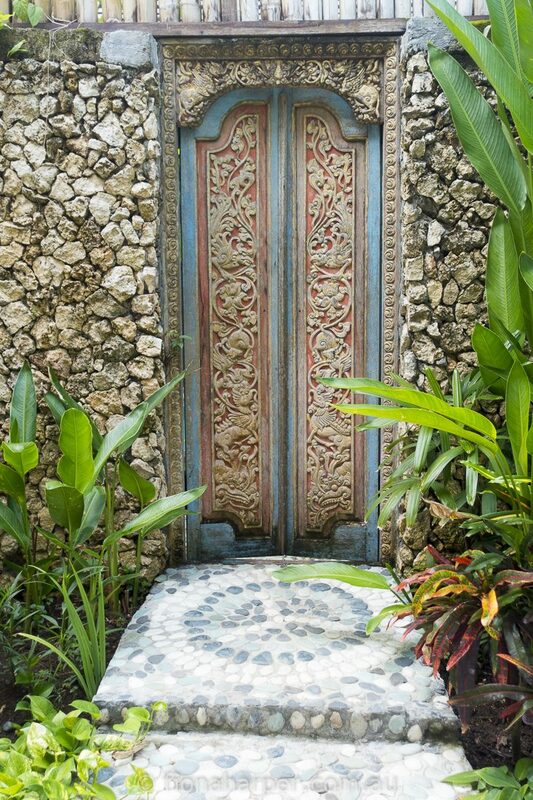 Couples will love: Tugu Bali has intimate spots in spades for loved-up couples to enjoy privacy. It’s akin to staying in a private museum – book a private dinner anywhere amongst the grounds or within ancient buildings. Ground level Dedari Suites come with private plunge pool while upper level suites have ocean views beyond timber shutters. Rates: Rejang Suites with partial ocean view start from USD330 per night. Dedari Suite is priced at USD390 per night. Check the web for special deals!